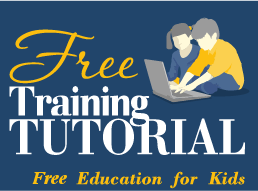 Our free educational games are used by more than 20,000 teachers & homeschooling parents! 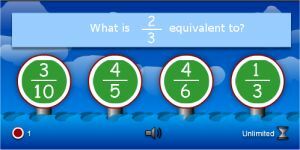 Four targets with fractions appear on the screen along with a question such as : "What is 2/3 equivalent to?". Shoot the target with the correct answer by clicking it with the mouse. There are 20 questions, click carefully because you get 1 point for every correct answer, but you lose 1 point for every wrong answer. Four fish will appear on the bottom of the screen, each one with a simple fraction on it. 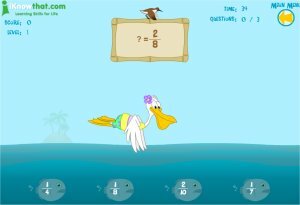 Help the pelican catch a fish, by clicking the one with the fraction that equals to the fraction that appears on the top board. Also, try to avoid hitting various obstacles on the way, which will cause you to loose time. Match the pairs by clicking them with the mouse. 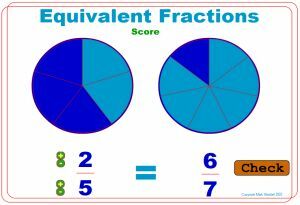 This version includes 4 pairs with easy fractions. Another version of the matching game, with more and harder pairs. Drag the green cards from the right and drop them on their matching ones on the left. There are a total of 9 cards. When you finish, you can get a set of new cards to practice. Hang the monkeys from their tails on the correct matching rings. The idea is to match the values the monkeys are showing in the signs they are holding, to those appearing above the rings. 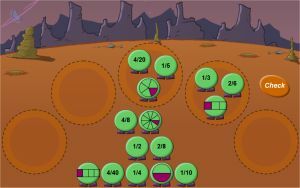 The first level is very easy and serves as an introduction, but the following levels will get harder. Make the left fraction an equivalent to the one given on the right. 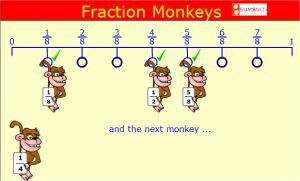 You control the left fraction's numerator and denominator by clicking the + and - buttons next to them. When you are satisfied with your answer, click the "Check" button. If you are correct, you will get hand claps and a new trial will begin. 15 fractions are located on the ground. Drag them into the circles around, and make groups of three equivalent fractions in every circle. When you finish, click the "Check" button to check your accuracy. 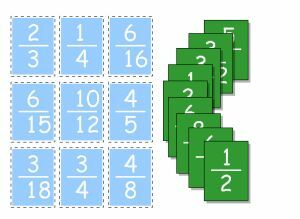 The interactive, free activities found here are meant to help students develop skills in identifying and comparing different sets of equivalent fractions. 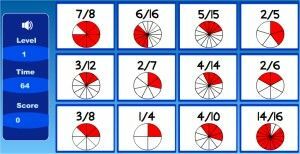 They will allow students to visualize each fraction by providing pictures and graphics, and show them other fractions that may or may not be equal. These lessons are suitable for kids in grades 3rd, 4th & 5th grade and are perfect for building skill and confidence in the subject area by letting the children have fun and learn about math, through playing games and injecting some excitement into the subject. 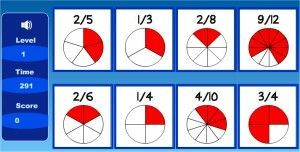 The games are relatively easy and provide a gentle to moderate challenge at each level, ideal for guiding students along in their journey in learning fractions.